"Nothing was as bad as Lone Pine"
- Lieutenant General Leslie Morshead. Lone Pine veteran. Commander of the Australian 9th Division, 'Rats' of Tobruk. 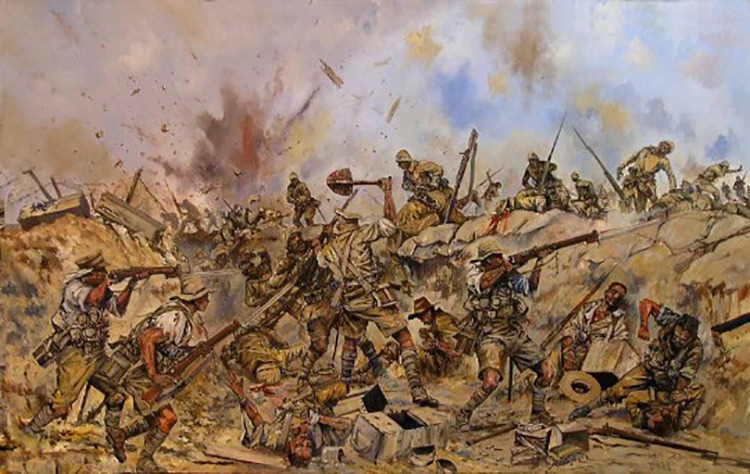 The Battle of Lone Pine took place between August 6 and 10 in 1915 during the eight month Allied Gallipoli Campaign. In a war characterised by appalling loss of life, personal sacrifice and residual damage, Lone Pine stood out as a benchmark to the veterans who survived it. Australia suffered 2277 casualties from 6 Battalions, including 80 officers, while storming the stronghold and resisting counter-attacks for 3 days. Seven Victoria Crosses were awarded. Turkey suffered 7,000 casualties. Notorious long before the great battle, the Turks had already named the position 'Bloody Ridge'. Brief account of the assault from those who were there. The garrison was held by two battalions of the Ottoman 47th Regiment, with a third battalion occupying nearby Snipers Ridge. The position was heavily fortified and built deep in the ridge with covered trenches. The Turkish entrenchments were “very strong and protected by stout roofing.” Chaplain Merrington. Chaplains Corps. Australian Light Horse. From the Australian positions on 400 Plateau looking towards the Turkish fortifications, a single pine tree could be seen on a crest on the south-eastern corner. “A small ragged pine tree standing out very gauntly and conspicuously in that wilderness of stunted bushes. This was named the Lonesome Pine.” Major Athelstan Markham. 2nd Field Company of Engineers. Before the assault shelling had shattered the tree but the remains were visible to Australian troops. The New Zealand Field Artillery, firing from Russell's Top, had the job of blasting the fields of barbed wire. There was a naval bombardment of the ridges. But the upward trajectory from the sea to the hills meant many shells passed over the top, leaving many Turkish fortifications on higher ground intact. When the Naval guns stopped, the whistles blew, and the rifle fire started. “As, after thunder, you hear the rain begin.” Turkish Officer. With a cheer that carried above exploding Turkish shells Australian soldiers lifted from their trenches and charged in three waves of 600. Into fire from a thousand riflemen. “The Turk’s rifle, machine gun and artillery lit up…Many men fell back killed or wounded into the trenches they had just left.” Major Athelstan Martyn. 2nd Field Company of Engineers. “Here, there, men staggered, crumpled, pitched forward, sagged sideways…the slaughter commenced from the second we emerged…machine gun and rifle fire came from the direct front and enfilade fire from both flanks.” Lieutenant Athol Burrett. 3rd Battalion. The first person Private Charles Duke saw in the surge across no-man’s land was 4th Battalion commander, Lieutenant Colonel Charles Macnaughten, charging ahead of him. “The crackling of bullets was so thick it seemed as though one was rushing over brittle twigs.” Private Charles Duke. 4th Battalion. “I glanced upwards to see nothing but a sheet of fire…caused by bursting shells of all kinds.” Corporal Joseph Neal. 2nd Battalion. “The daisy patch (no man’s land) caught alight and showed us up beautifully to the Turkish machine gunners…the fire was simply hellish…shell, rifle and machine gun…I’m hanged if I know how we got across…every bush ripped with bullets”. Private William Bendry. 2nd Battalion. ‘The men are taking the space between the trenches with great gallantry. Enemy artillery fire very severe, the scrub being alight in many places’ 1st Division Diary. “We were running like footballers. Just in front of me hundreds of our boys were trying to shift the timber, which was on top of the Turks’ trenches.” Private Edwin Rider. 4th Battalion. “This is suicide.” Private Cecil McAnulty. 2nd Battalion. “They were standing up over the Turks pumping lead into the trenches…” Private Charles Scott. 4th Battalion. “The men were trying to pull the logs off the top…the whole under rifle fire from the north. Once they got in the slaughter was tremendous” Major Carl Jess. 2nd Brigade. When the Australian shock troops got into the fortifications the devastating Turkish machine gun and rifle fire eased off its crescendo. “…Because our boys are in their trenches and the bayonet is at work”. Corporal Cyril Lawrence. 2nd Field Company of Engineers. The ridge was a Turkish fortress with a labyrinth of strongpoints, trenches and tunnels. The maze had deathtraps like machine guns concealed behind trapdoors, which could suddenly drop, eliminate Australian units and then close, concealed again. 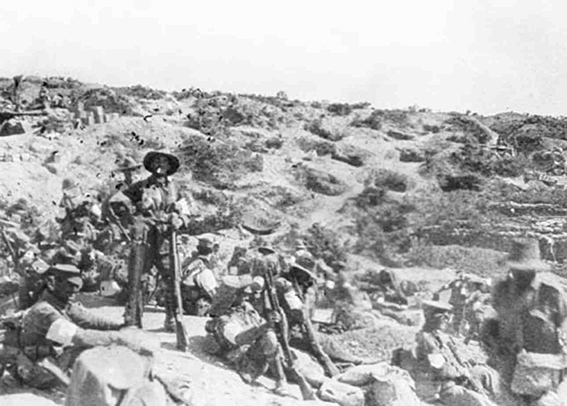 Turkish troops fought for each corner and bend as the Australians advanced. “We managed to get down through holes…Many of us just rushed over the front line and got into the rear trenches right among the Turks…probably the most gruesome, bloody and fiercest hand-to hand fighting of the whole war.” Lieutenant Athol Burrett. 3rd Battalion. 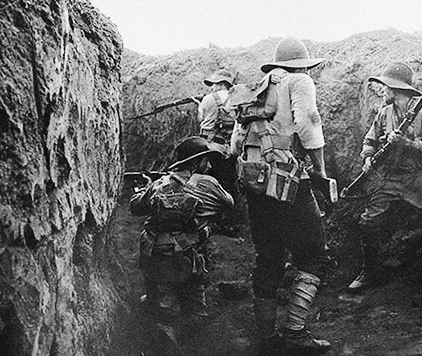 In the chaos, as the Turks reinforced positions, Australian machine gun crews scrambled up onto exposed ground, above those trenches packed with men, killing all the milling new Turkish arrivals. At the southern section of Lone Pine, Australian attackers, being hit by fire from two directions and from higher ground, also had to dig their way down through earth and timbers to enter the labyrinth. Sadly and typically, many of the most brave were killed immediately, leaping down into the dark holes to be shot or gutted. The Turks held the advantage at first, their eyes accustomed to the dark. Gun flashes strobe-lit the fighting. Horizontal volleys of rifle fire sent bullets hurtling out of darkness. “Lone Pine was a frightful hand-to-hand struggle, like a battle of savage beasts at the bottom of a pit, in which the Australians triumphed.” Lieutenant Colonel ‘Pompey’ Elliot. 7th Battalion. Many Turks were emerging from deep tunnels where they had taken refuge from the shelling, now spilling into the fight. Intersections were scenes of hellish struggle. Australians fought over strongpoints standing on the bodies of dead and wounded friends. Many barricades were thrown up as fighting positions, made with bodies of men who had been alive moments before. “The trench is so full of our dead that the only respect that we could show them was not to tread on their faces, the floor of the trench was just one carpet of them”. Captain Harold Jacobs. 1st Battalion. “The enemy turned all their weapons against us…they began to attack in waves…the weapons in the hands of the soldiers overheated…and our enemies profited from this situation…it was truly an apocalypse” Turkish Officer. 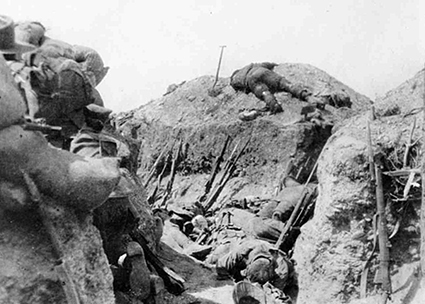 “The trenches were the most awful sight…the dead on top of the wounded and what a struggle to get the wounded out. The experiences are beyond telling, the nerve wracking intensity of the whole fight with its terrible slaughter. The pouring of blood and broken bones was too terrible to describe. All my strength was used up and I could hardly crawl around except in pain. The bravery of the Australian boys is without cavil. I buried in all something like 450. Burials were performed under shell fire. I felt honoured in staying with them…as I was the only Protestant Chaplain in the Brigade.” Chaplain ‘Fighting Mac’ McKenzie. Chaplains Corp. The mazework of trenches snaked across the top of the Lone Pine plateau, then opened down at the rear into Turkish held territory. Australians in the vanguard ventured down these tracks but were driven back by fire from deeper Turkish positions. Some of the intrepid men who penetrated so far into these Turkish positions and staging posts were killed. The sight of those dead Australians deep in their lines alarmed Turkish reinforcements mustering to counter-attack. “They had to pass up the Valley where Turkish dead were laid out beside the track four deep. They saw this column of dead men. At the upper end of it were some Australians, including a Lieutenant or Sergeant, a splendid looking fellow of very great stature, lying there - they had got well down into our position - and the sight knocked the stuffing out of the incoming troops.” Major Ahmet Zeki Bey. Ottoman 1st Battalion. “Major McConaghy and myself went on a little exploring expedition of our own following a communication trench until it petered out in the open in Owen’s Gully, and behold! - not ten yards from us was the stump of the old tree from which Lone Pine took its name. Our amazement was cut short in a twinkling for we immediately received the undivided attention of every Turkish machine gun and rifle in the locality.” Sergeant Major Goldenstedt. 3rd Battalion. Despite the tumultuous struggle to take the plateau, briefly described here, it was the long and dreadful counterattacks during the next three days and nights for which the Battle of Lone Pine is mainly known. The conditions worsened. The sacrifice and desperation was relentless. The Turkish suffered 7,000 killed or wounded. Australia suffered 2,227 killed or wounded. “An Inferno...” Major Martyn. 2nd Field Company of Engineers. Australia’s only supplier of genuine descendents of the GALLIPOLI LONE PINE.